Integra: Just stay on your guard. This toy of hers is powerful. It might not be the only surprise out there. 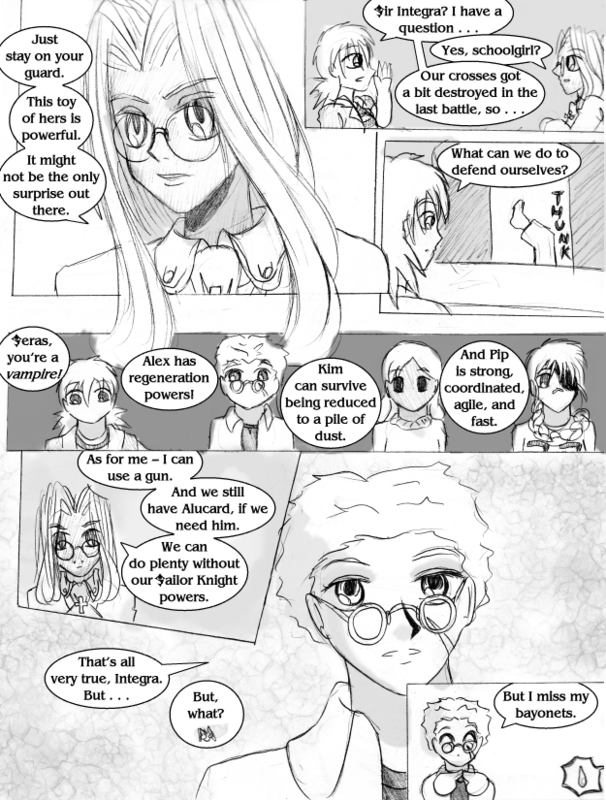 Seras: Sir Integra? I have a question . . .
Seras: Our crosses got a bit destroyed in the last battle, so . . .
Integra: Seras, you’re a vampire! Alex has regeneration powers! Kim can survive being reduced to a pile of dust. And Pip is strong, coordinated, agile, and fast. As for me — I can use a gun. And we still have Alucard, if we need him. We can do plenty without our Sailor Knight powers. Alex: That’s all very true, Integra. But . . .
Alex: But I miss my bayonets.